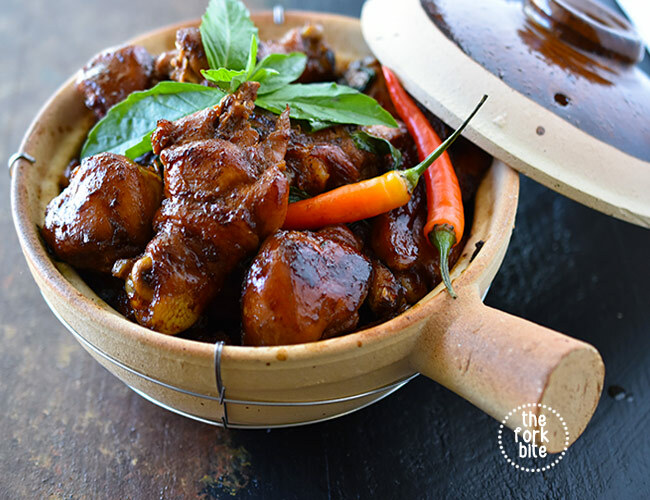 This 3 cup chicken (三杯鸡) is one of the most classic Taiwanese recipes that I used to love. The name itself comes from the three key ingredients: the rice wine, roasted sesame oil and dark soy sauce, while the “cups” refer to the equal ratio instead of literal measurement. I actually love the sauce and normally add it to steamed rice (I love having the sauce from this dish with the rice) and I could literally live with this kind of food. It’s savory, yet sweet at the same time and the flavors really pair well all together. There’s a slight hint of spiciness and also the fragrance of the fresh basil leaves. Check out this 3 cup chicken recipe adapted to my personal preference. Tip: If you’re a garlic lover like me, don’t skimp on the garlic cloves, you’ll love being able to eat the garlic whole. 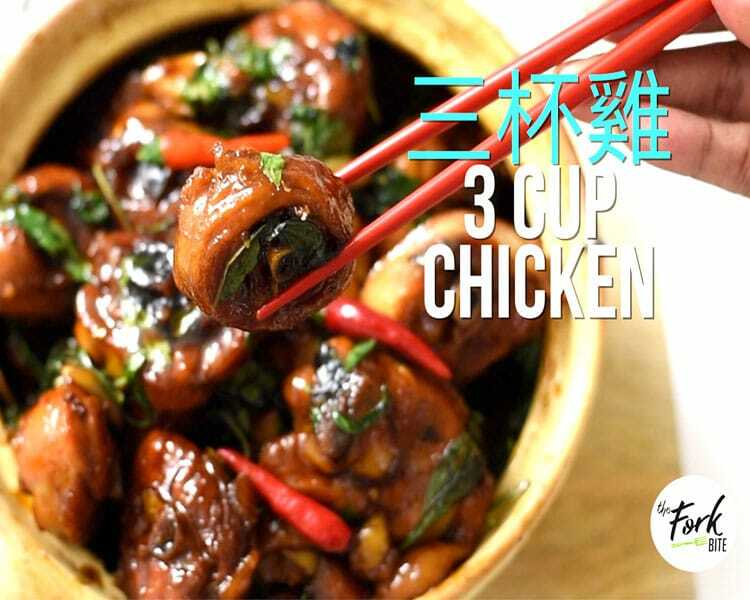 One of my favorites classic Taiwanese dish and it's called 3 Cup Chicken. 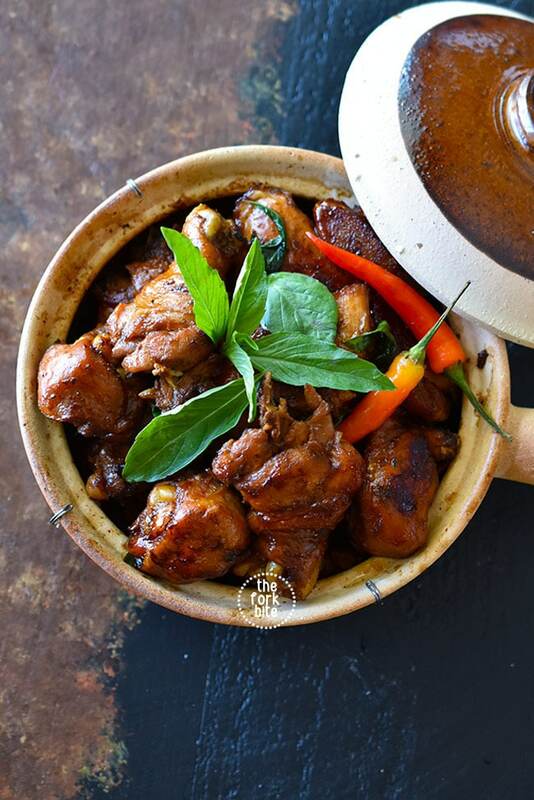 It's sweet and savory at the same time with a hint of spice and the aroma of basil leaves. It's best serve with rice (put sauce on top of rice). Cut the chicken into pieces and rub them with the baking soda. (*this is optional but will make the chicken more tender). Set aside for 10 minutes before rinsing the chicken off with water. Make sure the baking soda is completely rinsed off. Pat dry the chicken pieces and set aside. Heat up a pan over medium-high heat, add some oil. Saute the ginger until aromatic. Add the garlic and stir quick. Chuck in the chicken and fry for about 5-6 minutes or until golden brown. Keep it on a med-high heat, otherwise the meat will be tough. TIP: While browning the chicken take the garlic and ginger off from the pan to avoid getting charred. Set aside. Mix all the sauce ingredients. Set aside. After the chicken turned brown, put the garlic and ginger back and add the sauce mixture. Cover the pan and let it boil. Turn down the heat to low to cook down the sauce. Let it cook, uncovered, until sauce thickens, about 20-30 minutes. Once the sauce is reduced, we're almost done. Once the sauce thickens, turn the heat back up to med-high and add the fresh basil leaves giving them a quick stir, cook for another 1 minute. Transfer to a serving bowl and serve hot over steamed rice. I suggest to use the roasted sesame oil (dark sesame oil). This is a bit expensive but the flavor is strong and intense compare to regular sesame oil. I so love this chicken, they look so tasty and flavorful. I cant wait to try this..
Oh, my goodness!! 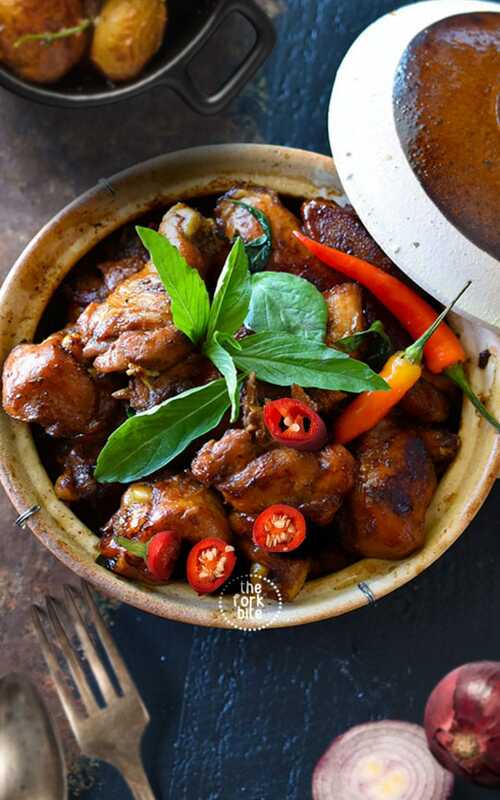 This 3 cup chicken recipe looks really delicious. It makes my mouth-watering and I feel so hungry right now. I am looking forward to trying this recipe. Will pinned this. The glaze/sauce on the chicken looks so amazing! It’s the perfect balance between sweet and salty! This looks so tasty it’s on my must make pronto list! Thanks for sharing the great recipe. I haven’t had anything Taiwanese yet. Actually, this is not spicy at all, even my picky eater kid loves this dish and he doesn’t eat spicy food at all. I have never tried Taiwanese cuisine but this looks so delicious. I would definitely love to try this. I am a veggie but even with a simple swap I could enjoy this recipe, it really looks incredible! My husband would love this … I will have to give it a shot. the pictures are mouth-watering! While my hubby and I enjoy spicy recipes, none of my children do, so I either have to adapt the recipe or prepare two different dishes 🙁 Do you think I could leave the spicy ingredients out or replacing them? what do you suggest? What a delicious sounding recipe! I’ll have to try this for my family soon as I think they’ll really like it. 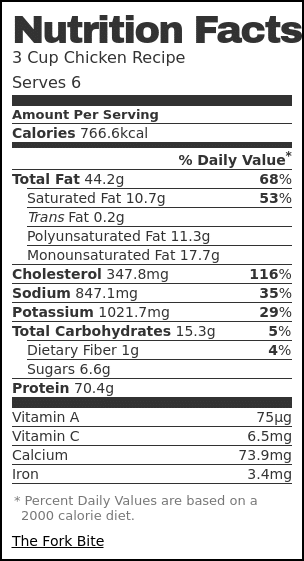 I wonder why the calorie content is so high though? Sure, any protein will do using this kind of sauce mixture. This dish is really easy to tackle. Oh Yum! That sauce on this looks amazing. 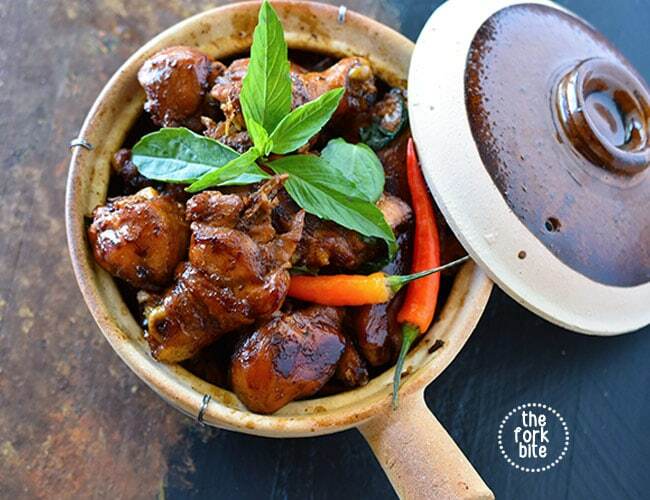 This recipe looks delicoius – but I would like to try that sauce on tofu! – or shrimp! The recipe sounds magnificent. I love spicy food and this looks delicious! I do like the Taiwanese food and buy it from my local restaurant, I would love to try this myself. I feel the same, I can eat them everyday without hesitation. I love garlic, so I’ll have those loaves whole! OMG THAT LOOKS DELICIOUS! This looks like a must try. I’ve wanted to try tai food for some time but haven’t has an opportunity. This is absolutely a magnificent recipe, and it takes less time to make. I am Asian food lover as always. This looks so delicious. I am in love the flavors in there. This goes in the Must-Try list. This sounds like the perfect family meal! Simple and my kids would love these flavors!! never tried something like this but definitely looks delicious! sounds perfect for weekend! That chicken looks perfectly cooked and I am loving all the flavours going on. Especially all the ginger. So many great flavors in this! I can’t wait to try it. I can imagine how delicious this recipe is. I love Asian flavors and toasted sesame seeds oils is one of my favorites when I cook noodles. I will definitely give this recipe a try! This is SO hearty and delicious, and the flavors are absolutely amazing! Total finger-lickin’ lip-smackin’ goodness. Sure, you can use maple syrup instead of brown sugar though I never tried it, I guess the taste would be the same. Thanks for explaining where the name comes from, that’s really simple and interesting. Can I use maple syrup instead of brown sugar? 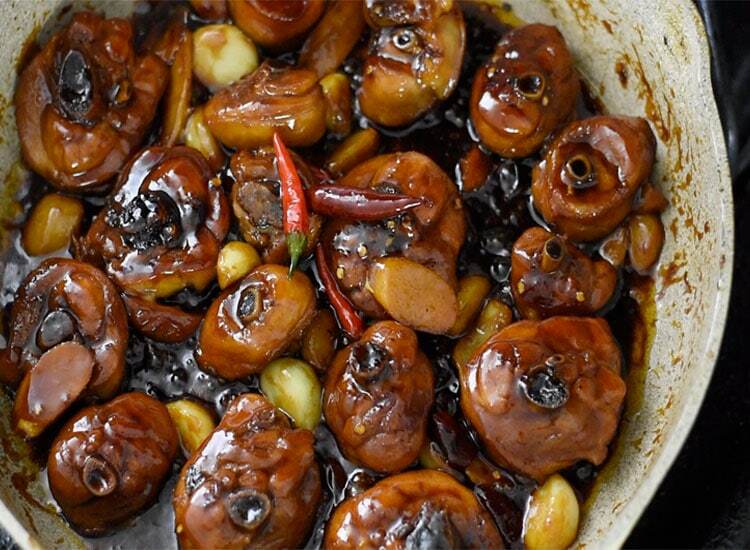 I’ve never tried any Taiwanese recipes but this looks really yummy!